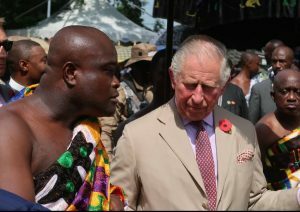 The Prince of Wales, Prince Charles, was treated to the rich Asante culture in Kumasi on Sunday. This was when he attended the grand Akwasidae of Asanteman at the Manhyia Palace. The Prince of Wales and his wife Camilla were impressed with the splendid cultural display. Prince Charles was particularly fascinated with a lion that was being carried by one of the servants of the Asantehene, Otumfuo Osei Tutu II. Prince Charles, who was on the dais, was seen pointing at the dead lion. 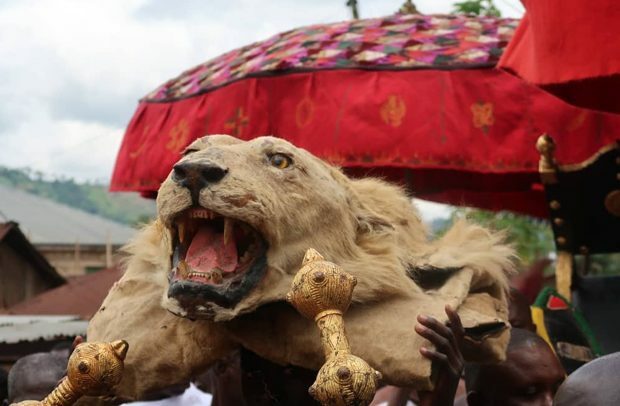 The Asantehene usually sits on the lion during public events, including Akwasidae. Prince Charles was seen asking the British High Commissioner to Ghana, Iain Walker, about the significance of the lion. The Prince of Wales starred at the lion for several minutes. The arrival of Otumfuo at the venue was characterized by the firing of musketry and other rich cultural displays. Some beautifully dressed Asante women danced to Adwoa tunes to entertain Prince Charles and Camilla.